I'll admit my ignorance up front. I haven't heard all of Janelle Monae's first part of the four part Suites series: an EP called Metropolis (props to my buddy Garrick for what I have heard), but if that short-play is anything remotely as incredible as her new full-length debut The ArchAndroid then I have more record shopping to do. Monae's voice carries an album loaded with inventive, fascinating pop-soul-R&B hybrid fantasy storytelling. Over 18 sprawling tracks, Monae blends classical, soul, pop and disco seamlessly. What's created is a dramatic, wild and innovative dystopia wherein Monae represents an android seeking freedom and purpose. And what happens is a dynamic, sometimes absurd but always enjoyable collection of dance-inducing music. Admittedly, all the genre-bending is the most striking part of the album's allure. It's at once complicated because you're not quite sure where to find your listener's footing, and the attractive aspect that keeps the music interesting. The opening track "Suite II Overture" is a flat out classic, hyper-dramatic musical theater symphony piece. And it fades directly into (with excellently placed audience claps) to "Dance Or Die," a song that features poet Saul Williams and drops directly into dance, hip-hop territory. In two tracks, at the inception of the album, it's already shown itself to have two completely different faces. The third song "Faster" manages to speed up and calm the themes from track two, holding down the fort (so to speak) so that album begins to feel more cohesive. It becomes a driving pop record that makes references to Roberta Flack, that's now about a chase. We've left the theater and now we're running. This is the story aspect of The ArchAndroid. Then, "Locked Inside" is more of a traditional funky soul song. The beat drops back and we're reminded strongly of Lauren Hill in her prime. For me, the highlights of the album are "Cold War" (an anthem about independence and loneliness), driven by drums, wailing guitar solos and quickly clattering cymbals, and "Tightrope," which enlists Big Boi and has a funky jazz vibe. Then there's the '60s-esque singer-songwriter folk track "Oh, Maker." And the sweet and catchy "Wondaland." It's dynamic all the time. Everything is change. Everything is transition. Really, Janelle Monae is a pure talent who has an incredible vision about the ways musical genres interact and play off of one another. There are no boundaries here. Jazz, rock, funk, soul, rap, and classical all coexist and rely upon one another. Monae's voice is incredible and reliable, and she takes each of these classes of sound and puts her own mark on each, never seeming out of place or strained. Historically, all of music has proven itself to blend and morph, and Monae is just showing that transition in fast-motion, high-speed camera style. All creativity leads to more creativity. And we can pay all our respects to classical musicians for making music a social gathering, to jazz, blues and rock for giving The People a voice, and dance music for tapping into both traditional ritual and our social need for bonding and the collective. And as a result, The ArchAndroid captures your imagination and demands your attention throughout. 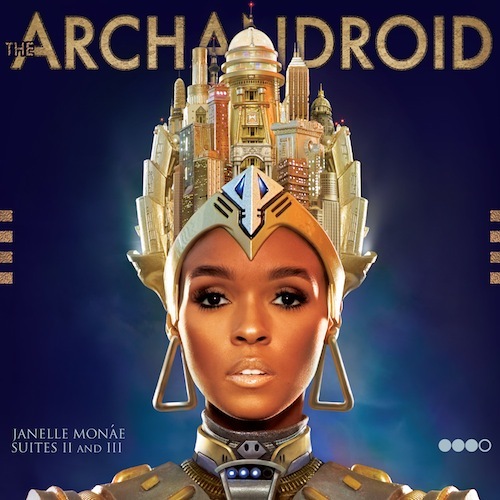 Janelle Monae is a rare and wonderful talent and this album is a must have.